The first violin part for Offenbach's Orpheus in the Underworld has been edited by Ilya Kaler, who has appeared as guest concertmaster with the San Francisco Symphony, Philadelphia Orchestra and Baltimore Symphony. Kaler's bowings, fingerings and other editorial markings have been added throughout the score. Jacques Offenbach's Orpheus in the Underworld (Orphée aux enfers) is an operetta that functions as an irreverent parody and scathing satire on Gluck and his Orfeo ed Euridice. It also contains satirical criticism of the stilted performances of classical drama at the Comédie-Française and the scandals in society and politics of the Second French Empire. First performed in 1858, it is Offenbach's first full-length operetta and more musically adventurous than his earlier pieces. The work is perhaps most famous for the culmination of the "Infernal Galop," of which the melody is most commonly referred to as the "can-can" and has been used in a variety of films and cartoons, almost always for comedic effect. 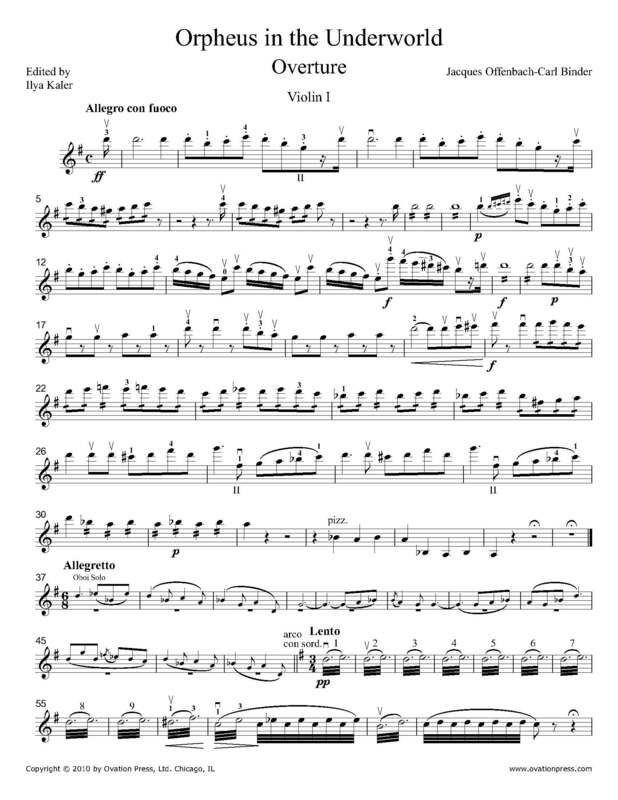 Download and print the score today to gain access to expertly edited Offenbach Orpheus in the Underworld violin fingerings and bowings from Ilya Kaler!